Sarah Dake Chapter No. 525 Order of the Eastern Star of Illiopolis was instituted February 5, 1904; in the Masonic Hall in Illiopolis. Sarah Dake, in whose honor the chapter was named, had been prominent as a loyal friend of the organization or their families. There were many in the community who had received friendly aid from her. Harris W. Huehl, who was Worthy Grand Patron of Illinois, had charge of the ceremony instituting the chapter. The first to receive the obligation and become Charter Members were: Georgia Correll, Helen Fait, Elizabeth Correll, Erma Drum, Rosa Ford, Joe Hale, Myrta Webb, C. Frank Rule, Lissie Faith, Frances Turner Fait, Gertrude Ford, Ora Boyd, C. E. Fait, G. E. Ford, and Arthur Drum. The following were installed as officers: Erma Drum, Worthy Matron; Charles Fait, Worthy Patron; Helen Fait, Associate Matron; Frances Turner Fait, Secretary. After the institution of the Chapter Flower City Chapter, Springfield, exemplified the work. Clara Bell Foster was the first candidate to be initiated into the chapter. The first school of instruction was held May 10, 1910, by Nellie Spence of Decatur. Sarah Dake Chapter continued to meet in the Masonic Temple until July 4, 1950, when the building and all the contents were destroyed by fire. Meetings from then on have been held in the Bickenbach building, now the property of the Masons. The continued progress of Sarah Dake Chapter is due to the work of many devoted officers and members during the past fifty-two years. Among them is C. Frank Rule who served as secretary for twenty-seven years and her husband, T. 0. Rule, who held office of Worthy Patron twenty years. The Order of Eastern Star of Illinois maintains an Eastern Star Home for the aged members at Rockford, Illinois, and a Sanitarium at Macon, Illinois. The present Worthy Matron and Worthy Patron of Sarah Dake Chapter are Claire Pritchett and Robert Pritchett. May Shellhammer is secretary. In the language of the present day the $64,000 ques­tion might be, "What is the reason for the survival of the Illiopolis Domestic Science Club?" The answer must be in its well laid foundation. First conceived in the mind of Mrs. Jennie Hesser her plan became a reality when a group of women visiting together in the back room of the Farmers' State Bank at the time of the Farmers' Institute decided to organize a club. Mrs. Hesser felt that homemakers needed to learn better methods of homemaking, social well being, and community betterment. In the early spring of 1910 the club was organized at the home of Mrs. Harve Roberts. Deborah Wright took the minutes and the other members present were Mrs. R. D. Dugan, Mrs. T. 0. Rule, and Mrs. George Hesser. Plans of the club were made known and the membership was doubled at the second meeting. 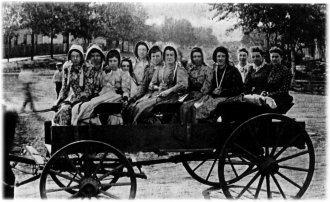 Thus, these far sighted women had organized the only Woman's Cosmopolitan Club in the village. Their motto, "East or West, Home's Best", the colors, red and gold, and a plan of direction by five officers have remained unchanged throughout the years as has the original idea of a club open to all women for one dollar yearly dues. With the help of such ladies as Mrs. Eva Correll and Mrs. Fred Dunn programs were given, including demonstrations of new recipes, soap making, use of the fireless cooker, sanitation, the electric stove, flower and hobby shows. One of the first projects was the furnishing of milk to needy children. This led to the first hot lunches where one hot dish was supplied and prepared by club members. As the project grew, Mrs. Olive Galloway was hired and club members took turns helping her serve lunches in the basement of the old Grade School. Six cents was charged for a meal. The equipment was donated. The Illiopolis Public Library was bred in one of the regular meetings, discussed several times, and finally while Clare Boyd was president, it was voted to set up a library in a room at the new grade school. Mrs. Gussie Cantrall was in charge. In 1919 a gift of sixty-five dollars was given to Mrs. W. P. Sullivan, who was then Secretary Treasurer of the Library organization. Mrs. Cantrall offered to match that gift to the Library. The first gift for the Library Room, which was in the new Grade School was given in 1926 ' The Club gave a Silver Tea to help raise additional money. Members of the community donated books and magazines and Mrs. Cantrall was seen pulling a small wagon through the streets of Illiopolis collecting books and magazines for the Library. Mr. Chapin, editor of the State Center Record, offered the Club an opportunity to raise money by allowing them to publish one issue of the paper. This was a short time after the Farmers' Institute meeting. Favorite recipes were published. Mrs. Dugan was chairman of the "Wit and Humor Committee" and she recalls "When our paper got in the public's hands, it created some comment, believe me." Perhaps there has been less comment as the years have gone, but throughout its existence, the Club has been an inspiration to each member for better living with herself, with her neighbors, and the whole community. On October 5, 1945, a group of interested parents and teachers met at the Illiopolis Grade School for the purpose of organizing a P. T. A. for Illiopolis Grade and High Schools. Mrs. Glenn Rudd was elected temporary chairman and Mrs. Harvy Long, temporary secretary. Mrs. W. H. Withey, District Director, organized the group. Regular meetings were to be held once a month, preceded by an executive board meeting. There were to be two vice-presidents, one a parent, one a teacher. A nominating committee composed of Mrs. Kent Roberts, Mrs. Ed Griesheim, and Mrs. Noah Garlits was appointed. At the next meeting the following slate of officers was presented: President, Glenn Rudd; 1st Vice President, Mrs. Joe Pritchett; Secretary, Mrs. Kent Roberts and Treasurer, Mrs. Ray Ward. There were twenty-three charter members. This organization has continued down during the past eleven years, with a remarkable increase in membership. The theme of "Better Family Living In Our Community"
Tea for beginners was begun. continued down through the years under the following Presidents. The present officers of the Illiopolis P. T. A. are: President, Mrs. Lynn E. Stengel; First Vice President, Mrs. Roy Adams; Second Vice President, Mrs. Lester Havener; Secretary, Mrs. Ed Melton; and Treasurer, Mrs. John Moore. We sincerely hope that the P. T. A. will continue on through the years with the growth of the Illiopolis schools and community, and will always keep uppermost in mind that its primary purpose is to promote better understanding between parents and teachers. Soon after World War I, a group of American Soldiers, realizing there would be a need for a veterans organization to handle the many problems of the returning veteran, met in Paris and formulated the idea for the American Legion. In 1919 the first National Convention was held in St. Louis. Soon after Illiopolis Post No. 508 was organized. The Illiopolis Post played an important part in giving aid to their less fortunate comrades. Food and jobs were provided and many times the Legionnaires dug into their own pockets to help a comrade traveling from one town to another. This aid was to continue up through the depression years. The 1st Commander of Illiopolis Post No. 508 was Dr. M. M. Fletcher. The late Dr. C. S. Mayes was post finance officer. Some of the charter or early members of the post still living in Illiopolis are Harry Pricer, W. J. B. Maxwell, W. S. Mussenden, Ray Ward, Wilmer Ward, Harry Pfeifer, John Kinahan, Col. Redman, L. R. Redman, Jesse Garren, Frank Saulsberry, and Bill Daily. Other activities sponsored by the Legion in the past and present include the Veterans Day celebration held here for a number of years, annual Poppy Day sales, and Memorial Day Services. For a number of years the Legion has sent a boy to Boys State for training in civic and local government. In 1948 the Legion now aided by an increase in membership from Veterans of World War II, purchased the old Miller building, site of the J. C. Ross grocery for many years. The Legion was aided in this effort by donations from several people in the community who were not necessarily connected with the Legion. Soon after a long term lease was secured with the U. S. Postal Department and U. S. Post Office is now located on the ground floor. Membership in the Legion reached a high of 62 soon after World War I and after World War II another high of 123. After a drop from the previous high, membership has been steadily climbing once again and now stands at 62. The continued efforts on behalf of the veteran and benefits already derived through the efforts of the Legion, such as: The G. I. Bill; College Educations; Veterans Pensions, G. I. Insurance; Civil Service job preference; Disability benefits, and representation in Congress on behalf of the veteran, as well as countless local benefits, insure the continued growth and activity of the most famous of Veterans organizations, the American Legion. The Ladies' Auxiliary to the American Legion was first organized at the home of Mrs. Emma Pletcher on February 1, 1932, and Mrs; Nell Loose was chosen as temporary chairman. A charter was obtained, and Mrs. Kathleen Kinahan was elected first President. Nothing much, but routine business took place. Poppy Day, as well as Memorial and Armistice Day, was observed. The members met at the Woodmen Hall for pot luck suppers. Gradually interest in the Organization died out, and finally the charter was forfeited. After the close of the Second World War, it was decided to reorganize, and a permanent charter was granted to Post 508 on July 23, 1946. Since then, the auxiliary has taken part in all civic and community affairs, as well as county, district, and state auxiliary projects. Each year contributions have been made to The Treasure Chest, Canteen Fund, Special Insulin, Vaponefrin, Christmas and Easter Gift, Downing Nursery, Hospitality, and Child Welfare; money and gifts are sent to the boys of Betsy Ross cottage at Normal, twice a year, at Christmas and at Easter, boxes of home made candy and cookies are packed and delivered to the veteran patients at St. John's Sanatorium. Many of the members worked faithfully with the Legion members in the drive to raise funds to help buy the present Legion Hall, and have helped with some of the furnishings. Poppy Day is observed yearly, and now four hundred poppies are sold on that day; the last two years, members of the Legion have assisted in the sale. A girl from the Junior Class of the High School is selected each year, and is sent by the auxiliary to Girls' State at Jacksonville; the expenses of forty dollars are paid by the Post. Several years ago, all Gold Star Mothers were voted honorary members. At present there are four Gold Star Mother members. Flags for the High School, the rooms at the Grade School and the Library have been purchased. Books honoring the boys who lost their lives in World War II were bought and placed on the shelves at the Library. ILLIOPOLIS EDUCATION AND RECREATION ASSOCIATION. During the past nine years the community has been served in numerous ways by the Illiopolis Education and Recreation Association. The beginnings of this organization date back to March 27, 1947, at which time a committee consisting of Father John McGrath, Mr. Dwight Shanks, Mr. Noah Garlits, Mrs. Glenn Rudd and Mrs. Isaac Loose met to organize a program of recreation for the community. It was decided at this meeting to ask all residents of the vicinity to gather at the High School on April 29 to form a permanent organization. This was done and a board of directors was elected which included Mr. Noah Garlits, Mrs. Isaac Loose, Miss Mabel Fisher, Mr. Glenn Rudd, Mrs. Kent Roberts, Mr. Robert Ed McDermott, and Mr. Joe Pritchett. In addition to this group it was determined that there should be an advisory board consisting of all heads of the community organizations. A position entitled Director of Recreation was created and Mr. Charles Burch was appointed to fill it first. By the end of June a Constitution had been approved by both boards and the I. E. R. A. became an actuality well on the way to collecting donations toward a goal of $1,000.00. Board members were not to succeed themselves, thus assuring the organization of a greater continued community participation. Organized tennis and softball were the first tangible results of the recreation program. Croquet and horseshoe pitching soon followed. In cooperation with the Red Cross a swimming program was initiated. A summer recreation school for young children was to become an annual project. Another continuous goal set was im­provement of the athletic grounds. Several other events initiated by the I. E. R. A. have been so well accepted and supported that they are becoming annual events. The Community Halloween Party, first held in 1951 was so successful that it has been repeated with variations each succeeding year. Several years a Community Christmas Program and Party has drawn our citizens closer together during the holiday season. The Strawberry Festival is another annual event sponsored by I. E. R. A. This centennial year those serving on the board of directors are Mrs. Lynn Stengel, president; Miss Connie Darnall, vice-president; Mr. C. E. Seaton, treasurer; Mrs. Marvin Martin, secretary; Herbert Bliler, Mr. Lawrence Easton, and Mr. William Peters. organized as a nonprofit making organization. Board of Directors-Herbert Dunn, Lee Febus, Lawrence Easton, Richard Turnbull. The club was organized with 102 members. The club has been quite active in all local and civic affairs, and have also participated in parades in surround­ing towns. For a while public dances were held in the former Burns-Midtown warehouse under supervision of the club until the building was leased by a bottling company for storage. The past two years they have sponsored the Polio, Benefit Dance in the high school under the supervision of Pat and Dora Welch which has been quite successful in contributing a sizable sum to the March of Dimes. For lack of a suitable place near Illiopolis, a horse show was held by the club in Mt. Pulaski in August, 1955 with over 100 horses attending, some from as far away as East St. Louis and Clinton, Ind. The club hopes to obtain a small tract of land near Illiopolis for a club ground which also will be used for other entertainment purposes. The Scout movement in this community as in others has been advanced by the efforts of volunteer workers who have felt their time was well spent in promoting the ideals of better living and better citizenship among boys. Rev. C. E. Barnett organized the first troop and acted as scoutmaster. Among the early scouts were: Frank D. Massock, Robert L. Williams, Nelville Barnett, Harold Knox, Boyd Fait, Jack Roberts, David Hampton, Marion Redman, Elbert Redman (deceased), George Redman (deceased), Cletus Hopkins (deceased), Earl Hopkins (deceased), Arthur Redman, Howard Barnum, George Sheller, Glenn Williams, Horton Fait, and Carl Constant. Assistant scoutmaster were Lloyd Havener and Russell Leonard. Other scoutmasters continued the work throughout the years until the boys of scout age became so busy with overlapping activities found today in school, church, and 4H that it seemed unnecessary to continue the work with boys eleven to sixteen years. On the other hand the cub scout movement began later and is still very active here. Cub work is centered about the home, encouraging the boy eight to eleven to achieve his best in the family circle and den. The first cub pack in Illiopolis was organized by Dr. and Mrs. W. J. Sturm on February 24, 1951, with P.T.A. acting as sponsor. Each succeeding year cub masters and den mothers and parents have worked with these boys and at present there are twenty-two cubs enjoying summer activities with Cub master Allen Castleman. The Illiopolis junior Woman's Club was organized in September, 1951, for the young people of the community in order to promote the social and educational welfare of its members and to promote civic betterment. The, club has sponsored, in the community, Amer­ican Week, Emergency Polio Drive, Cancer Crusade, X-ray Mobile Unit, and cooperated with the I. E. R. A. activities, Civil Defense Program, and the High school Homecoming parades. The club has contributed financially to all of the County, State and Junior Federation projects and has been a 100% club each year. Our financial donations in the community have included funds for library books, Library Building Fund, Music Camp Scholarships and other miscellaneous projects. We have a wide variety of both entertaining and educational programs. We have an annual guest night, style show and dinner-dance. The club's annual Smor­gasbord has proven to be a delight to all those who attend. Our club sponsors have been Mrs. Isaac Loose, Mrs. W. J. B. Maxwell, Mrs. Joe H. Pritchett and Mrs. W. P. Roberts. In April of 1951, a group of Illiopolis businessmen and public spirited citizens met at the Illiopolis Grade School to consider the organization of a businessmen's and citizens' club to take an active interest in the civic, commercial, social, and moral welfare of the community. On July 12, 1951, a charter was presented by the Lions International. Each year a pancake supper and minstrel show have been held to finance community projects. These annual projects include an Easter egg hunt, a high school athletic banquet, a Christmas home lighting contest, and Egyptian Music Camp scholarships. Many other services are ren­dered to the community each year by the Lions club members. On January 20, 1947, a group of ladies met at the home of Mrs. Arthur Sutherland and organized a Home Bureau Unit, under the direction of Mrs. Lula Keller, Home Adviser of Macon County. Fourteen members joined, and Mrs. Paul Rhodes was elected the first president. At that time, there was no Home Bureau in Sangamon County, and on November 25th of the same year, a reorganization meeting was held, and the unit became a part of its own county organization. Because Mrs. Rhodes had been elected a member of the county board, she resigned, and Mrs. John Hunter was elected president. Since then, there have been the following presidents: Mrs. Dorothy Booker, Mrs. Catherine Booker, Mrs. Lynn Stengel, Mrs. John Ostermeier and the present officer, Mrs. G. R. Weyhrich. Various programs have been held during the year, given at alternate meetings by the Home Adviser and local leaders. Local leaders attend training schools in Springfield, conducted by specialists from the University of Illinois, and then they present the same lessons to members of the Unit. Craft days have been held at various times during the year. Members have learned to make aluminum trays, straw baskets, and straw bags, to do beginning and advanced textile painting. The unit now has thirty-four members, two being associate members. The unit is the sponsor of the local 4H girls' club. One day each year, during the Illinois State Fair, the unit has charge of the kitchen and dining room of the Home Bureau stand. The members furnish about l00 home made pies and cakes, and prepare and serve the food on that day. During the years of its existence, the Home Bureau has always taken its part in civic and community activities.